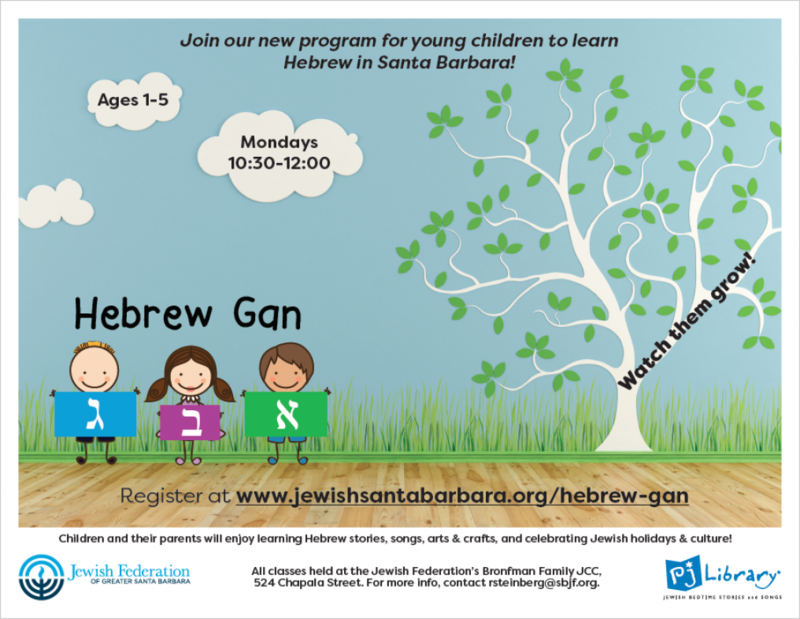 Announcing a new program for young children to learn Hebrew in Santa Barbara. Children and their parents will enjoy learning Hebrew stories, songs, arts & crafts, and celebrating Jewish holidays & culture. Questions? Contact Ruth Steinberg, JFS Director at rsteinberg@sbjf.org or call (805) 957-1116. All classes held at the Jewish Federation’s Bronfman Family JCC, 524 Chapala Street, Santa Barbara. Join us Monday mornings from 10:30 am-12:00 pm for $45/month starting November 7, 2016. Enjoy a a 50% discount for a 2nd child (ages 1-5).